Yellow Jacket cable protectors are the original cable protectors that have been in production for over 30 years. 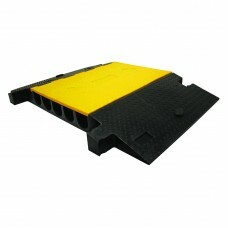 This makes the Yellow Jacket cable protection system one of the most tested systems on the market. Produced to the same high standards as the rest of the cable protection range, the Yellow Jacket is capable of taking heavy traffic. 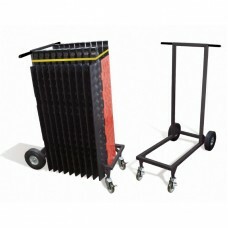 It is most popular with industries such as manufacturing, materials handling and entertainment. Durable Polyurethane Construction – Will withstand heavy traffic, and is resistant to common commercial chemicals, lubricants, and fuels. Made in the USA - Supporting American jobs. Extra Thick Lids - Provides quick cable access for fast installation, whilst still being ultra-hard wearing. Molded In Warning Symbols - Will never come off or need re-application. Like all of the Checkers cable protection range, this system can be lifted and re-fitted when needed. 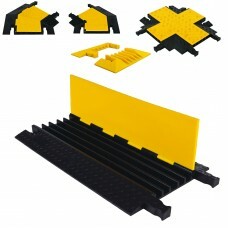 It is mobile and easy to install wherever it may be needed. 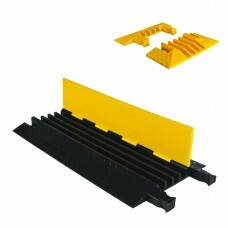 There is a multitude of accessories available for the Yellow Jacket, these include junctions and end caps that allow for easy termination of cable runs. ADA compliant sections can be added to runs to provide easy crossing points for wheelchair and scooter users. Dog bone style connectors ensure that joins between cable protector sections are solid and secure. 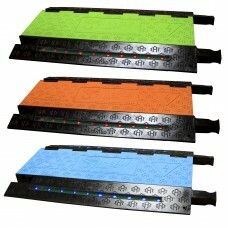 The modular design means that almost any length of cable can be securely protected. 45-degree and 90-degree crossing sections and turns are available to allow easy navigation of obstacles. Need assistance finding the right cable protector? Give us a call at (800) 671-9662 our experienced sales team will be happy to discuss your needs, whether it is large quantities or custom colors.